Part of the KSTAR device, at Daejeon, south of Seoul. This month ITER DG Kaname Ikeda took off for a two day visit to South Korea, where he visited the construction site of the Korea Superconducting Tokamak Advanced Research facility (KSTAR) in Daejeon, south of Seoul. 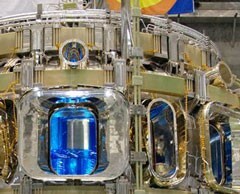 KSTAR is currently in its final stage of completion, with first plasma being expected in 2008. "I am very much impressed by the progress this project has achieved so far", Ikeda said. "Especially as this Tokamak will operate with ITER like specifications such as its superconducting magnets and the vaccum vessel so their experience will be fully reflected to the construction and operation of ITER." The ITER project plays a significant role for South Korea which imports 97 percent of its energy resources from abroad and is also known as the 10th largest consumer of energy in the world due to its major reliance on heavy industry. On the second day of his visit, Ikeda met the Vice Prime Minister and Science Minister Kim Woo-Sik, to report on the status of ITER construction. Also on the agenda was the ratification of the ITER Agreement by the Korean Parliament and the organization of the Korean Domestic Agency. "From the ITER point of view it will certainly be a big step for Korea to have the Domestic Agency in place", Ikeda said "and it is also significant for Korea to keep the momentum of the fusion society currently experienced with KSTAR so as to fully mobilize it towards construction of ITER."